Did you know that as of January 1, 2018, all single-family homes listed for sale in the City of Portland will require a home energy score report? This report must be obtained PRIOR to listing the home and made accessible to any potential homebuyer. This new requirement won’t affect homes currently listed, nor homes listed prior to December 31st. So there is a short-term ability to list your home before this new ordinance goes into effect. 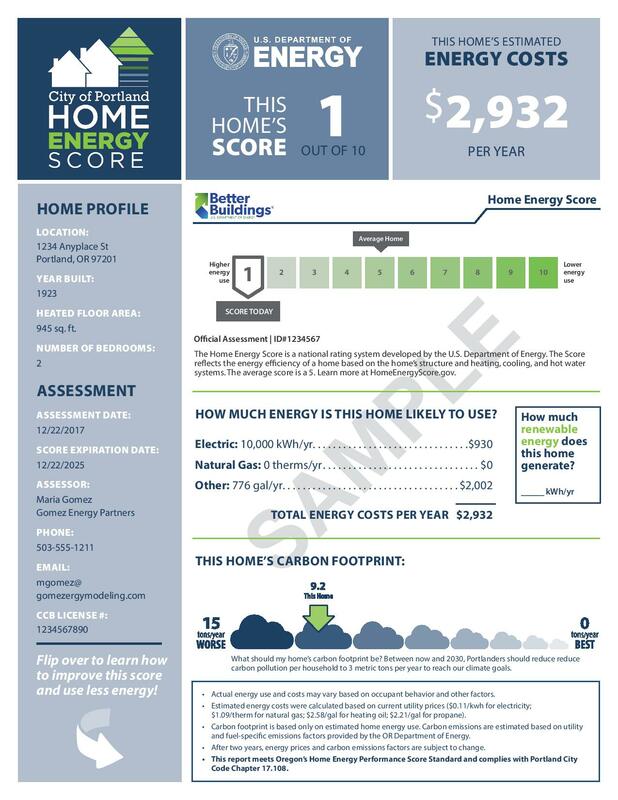 If your home is in the city limits of Portland, you are required to have this Home Energy Score Report done by an approved Home Energy Assessor. This does not affect all Portland addresses, only those within the city limits. Don’t know if your home is in the Portland City Limits? Go to PortlandMaps.com and enter your address- if the Jurisdiction shows “City of Portland”, then you are within the boundaries that require the Home Energy Score. If it simply says, “Portland”, then you are not required at this time. It also only affects single-family homes….which includes houses, duplexes, townhomes or any condo that does not have another unit below or above it. (Condos that have a separate unit below or above are considered “stacked” units and they are exempt from this requirement). How do I find an approved Home Energy Assessor? I have several I can recommend. This is something that needs to be done before listing the home and at this time, the cost is about $200-$250, but that will vary depending on the assessor you hire. Some assessors are claiming they have a goal of 24-48 hour response time, from the moment you place the call to schedule, to the time you have the report back in your hand! The inspection/assessment is estimated to take about 1-2 hours. We have become accustomed to ratings on products. Like when you buy a car- you like to know what the MPG is expected to be. It won’t necessarily prevent you from buying that car, it’s more for informational purposes. Some people are OK with purchasing a vehicle that only gets 15 mpg while others really want a car that gets 40+ mpg. The Home Energy Score returns an estimated yearly cost of the energy that will be used by the home… and rates the home’s overall energy efficiency. Here are some sample reports so you can see how they’ll look…. 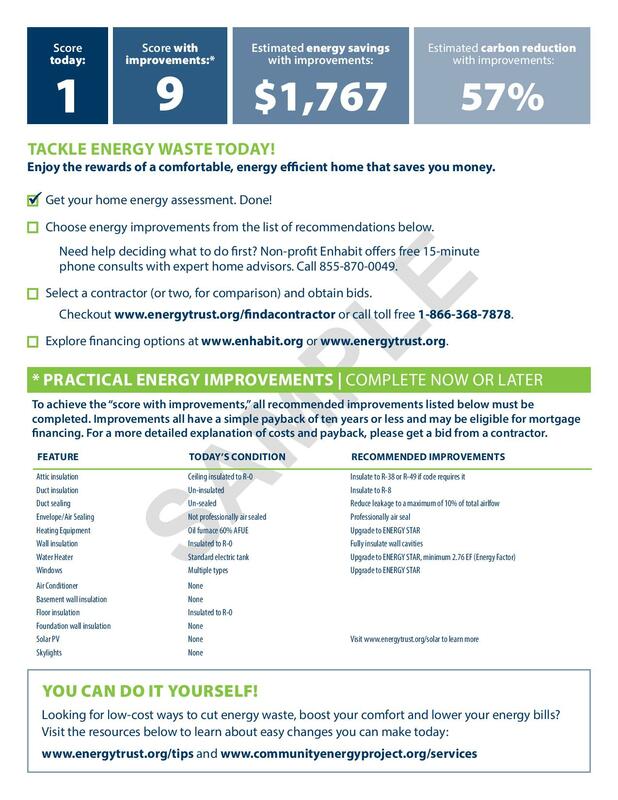 What I really like about this report is that it also provides a list of things you could do to improve the score of your home- adding insulation, sealing ducts, upgrading to more energy efficient heating equipment, windows, etc. If you DO decide to do any of those upgrades, the same company will come back and re-score your home for a significantly reduced fee. If you are thinking about listing your Portland home in the near future, and have questions….I’ve got answers! Just call, text, or email me and I’m more than happy to discuss options and timing and see if we can come up with a plan to maximize the value of your dollar and get you the most money out of your home. Thinking about selling your home but don’t know where to start? Download my free Seller’s Guide to learn more about the home selling process- including steps for cleaning, staging, and more! Next Next post: Does YOUR HOME have one of these top 6 OUTDATED features?